Rereading the Fantastic Four comics from the start. Enough talk about the new movie, let’s get back to COMICS! Issue #242 gives us one of the all-time great Galactus battles. When we last left our heroes, Galactus’ former herald Terrax had attacked, destroying the top two floors of the Baxter Building and lifting all of Manhattan into space. He gave the FF an ultimatum, saying he’ll destroy Manhattan unless the FF kills Galactus for him. Sue and Frankie Raye are atop the ruined Baxter Building to recap this, while Sue uses her powers to make Terrax’s energy field around the city visible. Frankie grows fascinated with Galactus. Elsewhere, at Avengers Mansion, Captain America and the Wasp are late to the party, wondering why the mansion is on emergency power and what’s happened to the sky. In space, Ben wants to fight Terrax but Reed talks him out of it, saying Terrax has the upper hand so they’ve got to play his game for now. Galactus’ ship is nearby. He is weakened from not having devoured any planets in a while, and draws upon energy in his ship to keep him going. Now inside the ship, Reed recaps the plot again, and reminds Ben (and the reader) that Galactus fought alongside the FF against the Sphinx in issue #212. He hopes to convince Galactus to join them in stopping Terrax. Terrax guesses this is what’s happening, so he attacks. Galactus unleashes the “white light of creation,” zapping Terrax and restoring Manhattan back where it belongs. At HQ, Sue collapses from exhaustion. Frankie knows she should watch over Sue, but is instead so overcome with thoughts of Galactus that she goes inside to look him up. Atop the World Trade Center (sigh…) Terrax believes he’s more powerful than Galactus and tries to fight him. 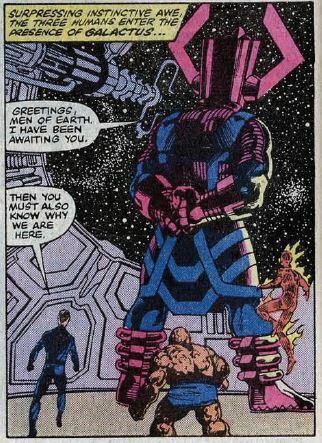 Galactus proves him wrong by taking back the power cosmic and turning Terrax back into his original self, Tyros. Tyros gets thrown into a NYC trash pile. With that done, Galactus decides that his hunger is too great, and he must feed. He seals the FF up in force fields, and then recreates his world-devouring machine from dust particles in the air around him. Just when it looks like he’s about to pull the trigger and destroy the Earth, he’s struck by a giant bolt of lightning. 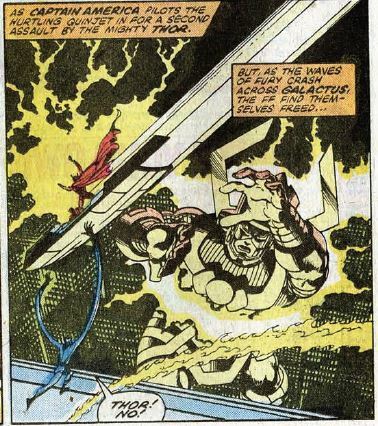 It’s Thor, who blasts Galactus with a classic “I say thee nay!” He’s on scene with three other Avengers, Captain America, Iron Man and Wasp. Begin fighting! The Avengers knock Galactus down to street level, using their powers against him in various ways. Dr. 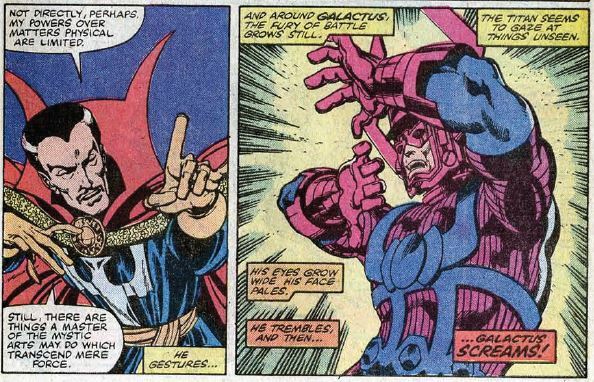 Strange shows up, and creates hallucinations that prey on Galactus’ fears. Spider-Man and Daredevil are here as well, but merely watching from the sidelines, letting the “big guys” handle the big cosmic threat. Finally, Reed stretches himself into a slingshot shape and shoots Ben at Galactus. Ben his Galactus right in the face (!) and Galactus falls, defeated. Unstable molecule: Reed spends most of this issue trying to convince everyone not to fight Galactus. This is foreshadowing an even bigger cosmic storyline coming up. Fade out: While pushing her powers to their limit, Sue is still able to tell Frankie (and first-time readers) all about who Galactus is. Clobberin’ time: Ben says he’s glad to be out of his spacesuit, because he thinks it’s constrictive and limits his movements. Make of that detail what you will. Flame on: Johnny is actually in favor of just letting Galactus die, but Reed won’t have it. 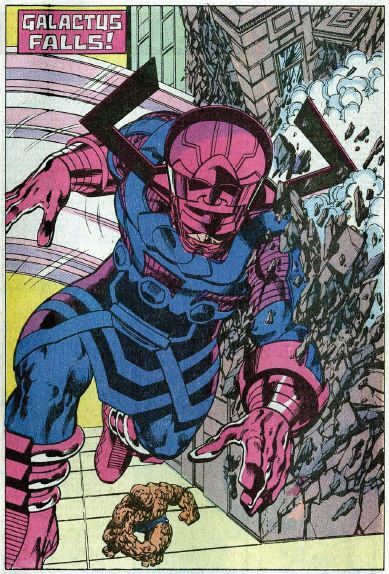 Johnny is also the one who manages to locate Galactus when he and his teammates are lost inside Galactus’ ship. 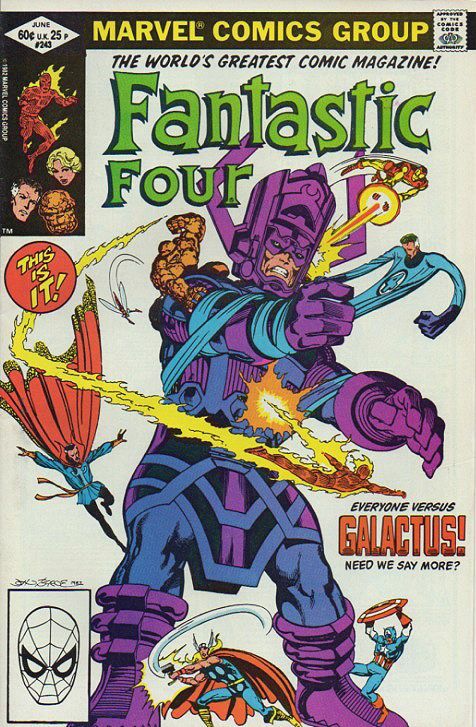 Fantastic fifth wheel: Frankie’s weird obsession with Galactus will pay off next issue. The letters page in this one answers the question of what code name to give her. Although some fans call her “She-Torch” during this era, the letters page confirms that name is not official. Instead, it says, the female Human Torch is simply named… the Human Torch. 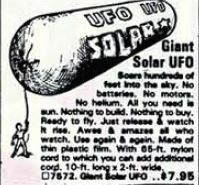 Commercial break: This is just a balloon, right? Trivia time: Right before this issue, Galactus had just been to Earth two times, only to be driven back to space by Rom the Spaceknight in Rom #27 and, of all people, Dazzler in Dazzler #11. Fantastic or frightful? Having all these Marvel heroes in one issue means our main FF characters are on the sidelines for most of the story. Nonetheless, this is great fun. With Galactus in a weakened state, the superheroes are finally able to kick the crap out of him in a big way. This one’s a big action blockbuster, and I love it. Next: Heralds and heart machines.